As some of you may have seen on my Facebook page I have plans afoot to host a charity evening based here in Braintree, Essex to raise awareness and some money for Crohn’s and Colitis UK, the UK’s leading charity for IBD’s (Inflammatory Bowel Disease) such as Crohn’s and Colitis. As well as providing funding for life changing research projects they help to support people living with these conditions. I have confirmed with a brilliant venue, Tomo’s Tavern, who are supporting this evening on the 23rd of April. We have a number of live acts already confirmed, as well as some other events to keep you entertained through the evening such as a raffle and karaoke. I’ve shared some of my experiences on this blog, and have started to scratch the surface on how these experiences have made me feel and how they have affected my life. I’ve battled through the crushing stomach pains, been weighed down with the extreme fatigue, and spent long stints of life planning my day around when I will be able to make an urgent dash to the gents. Crohn’s has had a fair go at taking over my life! On top of this I’ve spent a huge amount of time in hospital being prodded and poked, having tests, having treatments and surgery to try and keep things on an even keel. As things stand: Crohn’s is incurable. I’ve mentioned this in a number of articles, and have said all along that I know as good as I am feeling at the moment I will more than likely go through another flare up in the future. My experiences of these flares range from bad, through rotten to scary, and with knowing that could well all happen again, it takes a lot to stay positive. With this in mind, knowing that research into Crohn’s is being carried out which will allow better management of the disease is a great comfort. A greater dream is the day when the possibility of a cure is on the horizon! It’s light at the end of a really dark tunnel, and I am sure I am not the only person who has this view especially during the darker days. Over 300,000 people in the UK alone have been diagnosed, which works out to around one in every 213 people, so thats a lot of people who benefit from the brilliant work carried out by this charity. With those odds it’s not unlikely that you know someone with one of these diseases. Last year Crohn’s and Colitis UK awarded an amazing £700,000 towards research projects to better understand these diseases. This epic amount has been made possible by the generosity of people supporting nights like this as well as many other fundraising events all over the country. I’ve seen first hand a big development over the last 16 years in the monitoring and the management of Crohn’s. But there is still a lot more research that is needed. 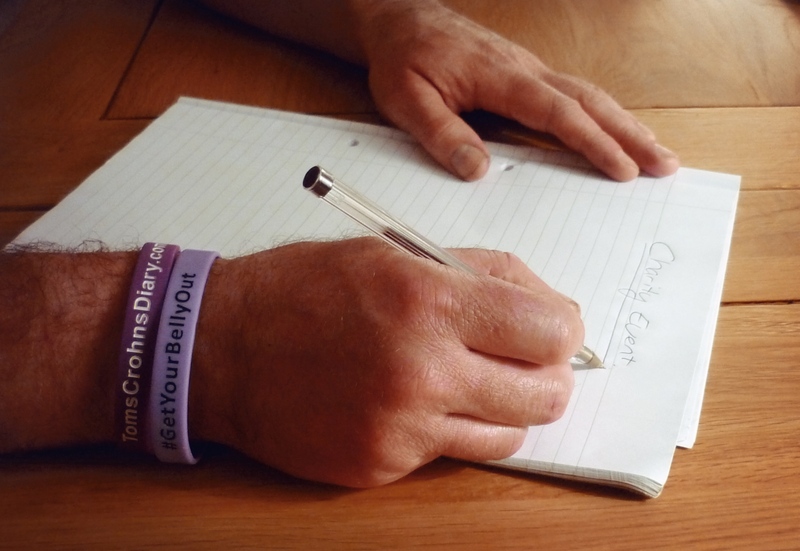 As well as funding these research projects Crohn’s and Colitis UK can help to improve the lives of people living with an IBD though support, providing facilities, and information. This is just a brief outline of the charity; if you are interested in learning more about them and the work they do please take a look at their website. If you are interested in supporting us on this evening then there are a number of ways that you can help out. The first one is to come along and enjoy the evening! The address for Tomo’s Tavern can be found on their Facebook page. Alternatively if you are a musician or are in a band who would like to play on the evening please get in touch and we can arrange a slot. As I mentioned we are hosting a raffle so if you are able to donate a prize, whether something as an individual or if you are a local business and are able to donate vouchers for your business, then also do get in contact. For all enquiries for the evening please send an email to: TomsCrohnsDiary@hotmail.com. Thanks for reading of this post people. I will be keeping you updated with this event, and I hope to see some of you there on the evening! This entry was posted in Awareness, Background information, Fund raising and tagged Charity event, Crohns and Colitis UK, Fund raising, IBD awareness. Bookmark the permalink.